The four-year Olympic cycle seems to come around with increasing regularity as I get older. As a consultant psychiatrist and advisor to a number of national sports organisations on mental health – I am fascinated every time. Each Olympic Games brings new hope and new challenges for all competitors and their supporters. Among those supporters will be family, friends, team-mates, and coaches, and a wide range of other disciplines – all helping the athlete to his or her best performance. The latter will include medical staff such as team doctors, physiologists, and physiotherapists. They can all expect to be kept busy attending to the health and performance needs of their athletes. Recent years have brought recognition that sportsmen and women may have mental health needs that are just as important as their ‘physical’ health – and that may need to be addressed. Athletes are people too, subject to many of the same vulnerabilities as the rest of us. In addition to our everyday anxieties, the sports world contains a whole host of different stressors. The impacts of injury or of retirement are particularly associated with psychological stress, even depression, and in weight sensitive sports, the prevalence of disordered eating has long been noted. With this in mind, overcoming obstacles and adversity is integral to the life of an athlete. Adversity may take the form of a setback such as an injury, or chasing down a lead against tough opponents. One of the major challenges for an athlete is overcoming that posed by his or her own psychological state and more specifically, the ability to overcome and manage pressure. These pressures are factors or combinations of factors that increase the importance of performing well. They may be real or exist primarily in the mind and perceptions of the athlete. Sport has become a global industry. Events such as the Super Bowl and the Olympics are among the most watched events on the planet and evaluation is largely by binary criteria – winning or losing. An athlete’s performance is judged (whether by themselves or others) and in turn, there are consequences (real or perceived) associated with the outcomes of performance. An athlete will believe (and very often, rightly so!) they have something significant to lose or to gain, known as the ‘fear of failure’ or ‘fear of consequence’. 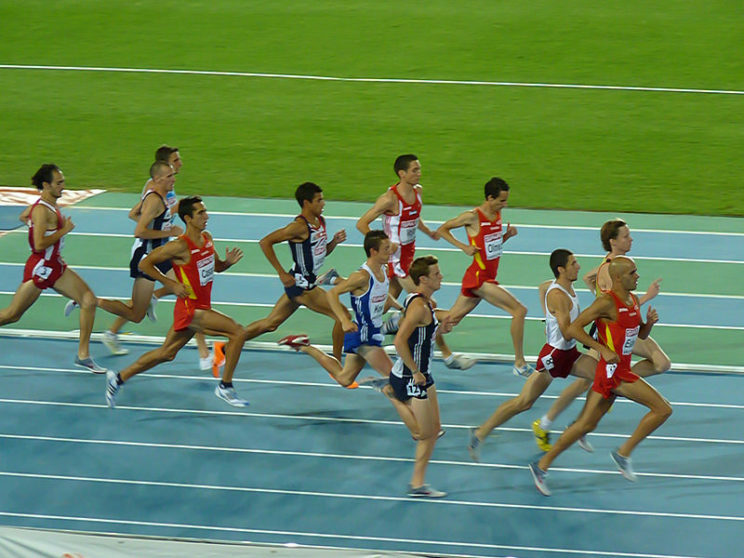 2010 European Championships in Athletics – during 1500 m final by Antonio Olmedo. CC by -SA 2.0, via Wikimedia Commons. Anxiety associated with performance (commonly referred to as ‘competitive anxiety’ or ‘performance anxiety’) has been explored primarily via the applied practice and empirical research of sport psychology. It has been defined as ‘an unpleasant psychological state, in reaction to perceived threat concerning the performance of a task under pressure’. It is considered to be the most common source of situational stress in sport, and is related to the perceived ‘ego-threatening’ nature of the competition. The added public scrutiny and evaluation in sport can mean that both participation and performance are strongly linked to an athlete’s self-esteem and self-worth. Therefore, when working with an athlete, it is important to understand the meaning of sport and performance for that individual athlete. But what can we all learn from this? Many athletes struggle to come forward and acknowledge their mental health concerns – and when they do, help is not always readily available. For these reasons, two recent stories have caught my eye. From 2005 to 2010, Andy Baddeley was Britain’s leading 1500m runner with a wealth of honours and victories to his name. A depressive illness halted his progress, but as a result, he became a vocal advocate within the mental health community and beyond. In July 2016, he returned to sparkling form with a sub-4 minute mile on the same historic track where Roger Bannister recorded his epic time in 1954. The story of hurdler Jack Green too is one that inspires hope and optimism for recovery. Suffering from depression throughout most of 2012, he still managed to make the Great Britain team for the London Olympics, where he narrowly missed a medal in the 4x400m relay. Green also qualified for Rio 2016, where he achieved 8th place in the Men’s 400 metre hurdles semi-finals. Congratulations Jack and Andy, an inspiration to us all! Featured Image Credit: ‘Swimming, Swimmer’ by tpsdave. CC0 Public Domain via Pixabay. Dr Alan Currie has been a consultant psychiatrist in full-time NHS practice in the north-east of England since 1997. He has advised a number of national sports organisations on mental health matters and in 2007 he edited, and co-authored the UK Sport guidelines on eating disorders. 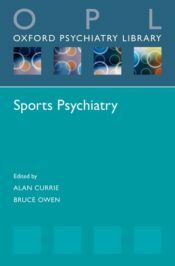 Along with Bruce Owen, he is author of Sports Psychiatry; a concise and practical pocketbook covering the breadth of psychiatric conditions that can present in sportsmen and sportswomen.